View from a block away shows why it’s impractical to just raise the First Avenue rail overcrossing. 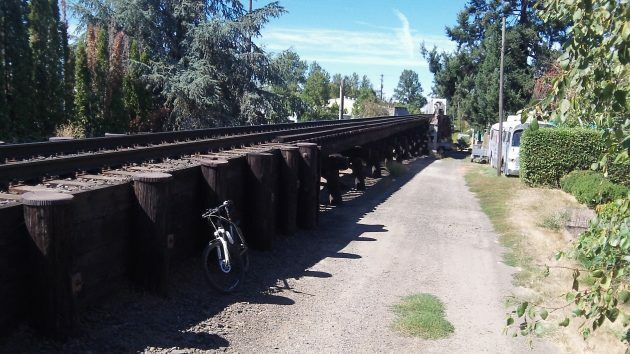 Now that we’re talking about Albany’s infamous truck-eating trestle on First Avenue, why not solve the problem by lowering the street or raising the structure holding the track? Because while it sounds like the most straightforward solution, it’s impractical. If it were feasible, it would have been done long ago. About 20 years ago, and then again more recently, the state highway people in ODOT discovered that many of the overpasses on I-5 were too low for modern trucks and mobile-home transports. So they lowered the freeway. Now, under most of the overpasses in the mid-valley, the pavement dips about a foot or so. But the same can’t easily be done on a city street without disrupting the driveway access of residential and business properties on the street, not to mention dealing with underground utilities. Raising the railroad track is even less feasible. Unlike motor vehicles, trains can’t negotiate steep or short inclines. So the track would have to be raised for a long way on either side of the street crossing. That would probably entail reconstructing several grade crossings south of First as well as, to the north, the 1921 steel bridge that carries the track across the Willamette River. After last week’s city council discussion of the problem — more or less frequent crashes into the trestle bridge by tall vehicles driven by inattentive operators — the city staff has looked at the issue more closely. City Manager Wes Hare emailed council members his preliminary assessment on Monday. Hare learned that at similar crossings elsewhere, crashes have continued despite ever more elaborate warning systems and devices. He said there’s a $200 gizmo truckers can use to warn them of any obstructions, but obviously the city can’t hand these things to everybody driving a truck through town who doesn’t have one. So to recap, there’s nothing much that can be done different when the offending drivers, who cause the wrecks, are dumb as dirt. Suppose the hh goes about to the local truck rentals and gets some numbers on how many clients get wedgies. If so, then you have a reduced tare audience and who might also be interested in solving the problem. Or at least their corporate insurance might be interested. I am sure there is something that can be done at a reasonable expense better than the chains. The problem with the chains is that they may not hit the cab of the truck, if they hit the trailer the driver may not hear it. Either way there are plenty of warnings ahead of time. Really though, is this a problem that the Albany tax payers should be paying to fix? Sounds more like a problem for the railroad, trucking companies, and insurance companies. Is there any data collected on these trestle wrecks? Repeat offenders in the form of trucking outfits? Can’t imagine it too likely but repeat drivers? Here is one possible low cost effort for consideration. Perhaps the city needs to reach out to these entities in the form of educating them of this danger spot. Why would anybody want to “fix” this ongoing source of amusement? It’s a pity that the bridge does not have its own youtube channel like some of the others. Maybe we can tax revenue from the video channel to hire a rapid intervention team that rappels down the bridge and hold up stop signs when the see an over-height rig approach. If I were the owner of one of these trucks, there would be no repeat offender! I think the inattentive driver would be seeking employment elsewhere and that employment wouldn’t be as a truck driver! The bridges over the freeway were raised. They cut the pillars //jacked them up by gripping both ends of the cut//added rebar and concrete. The concrete patches can be seen on the pillars. These were railroad crossings? Or bridges (overpasses)? Hasso already explained why it is not that simple. Except they don’t carry long trains with thousands of tons of load that need to be moved at low speeds through a residential area. You need to get a grip and learn to read. Hasso said they lowered the freeway under the overpasses and Tom pointed out they raised the overpasses rather than lowering the freeway.